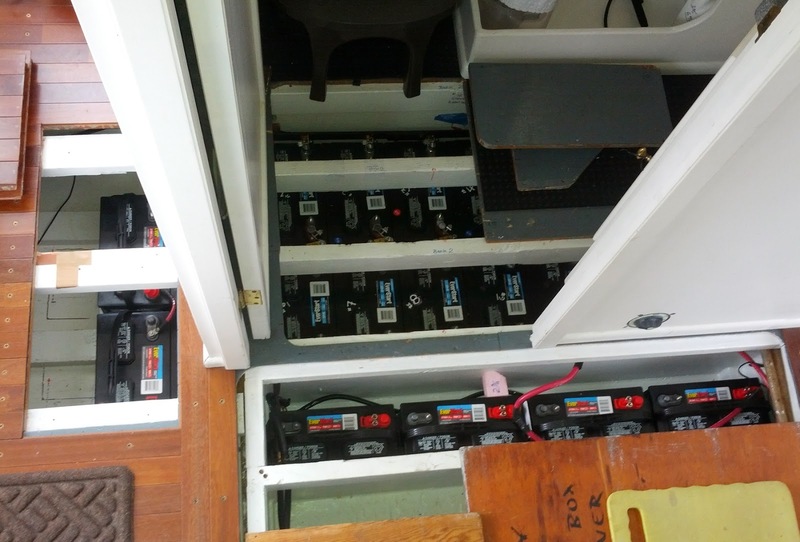 No, the pirate captain ain’t beating the crew, just installing more batteries to get back into the salt water and begin the Great Loop again. Just a little over five months ago was the initial Great Loop shakedown. In the weekend trial there were a few problems that needed to be addressed. One weighty problem was the old 12 volt batteries that needed to be replaced. Although a set of four batteries were somewhat older than the ten that were newly/additionally installed, the temperature sensor and the equalizing charge had been set incorrectly. The error in the setting literally burnt out a number of plates within each of the four batteries, mortally shortening their service life. I have doubled the number of replacements (now 8) and will use these to ballast the boat correctly. 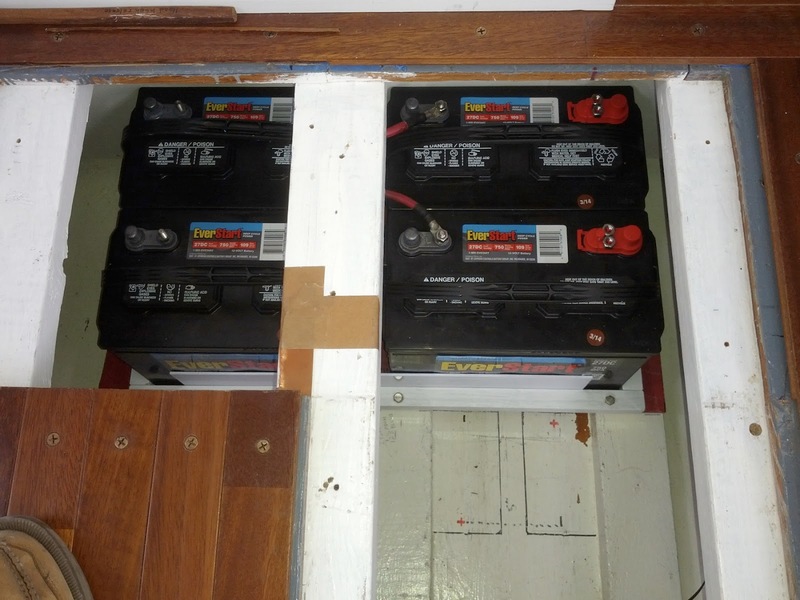 A few pictures show the four (red & blue tagged) batteries in the center of the boat beneath the galley and the additional four in the forward saloon under the sole plate. The battery type is 12 volts and will be replaced by new batteries from Apollo Energy Systems. The ones used now have about 1,200 watts each while the AES battery will have 2,980 watts each with a smaller foot print. With the present set of 18 batteries a 21,600 watt store of energy is about the theoretical maximum. The same number of AES units would be over 53,000 watts and take up less space. So I will have to make do with a common deep cycle battery until the new AES units arrive in the August 2014 time frame. Wiring of the new AES units will be nearly the same with shims added to the battery box for the smaller foot print. I was planning on placing multiple AES 2 volt units much sooner but they were too tall for an easy fitment solution, thus requiring me to wait for the latest and greatest in August. To compliment the added battery storage capacity, the addition of 5 more 235 watt solar modules are being placed on the boat roof. These will be temporary, to be used in long crossings and strong tides and currents. When not in use they are to be stored flat/vertical against the forward and aft bulkheads. This use could be compared to a spinnaker on a sail boat for extra power or speed. The weather has been dreadful for accomplishing meaningful deadlines. (As if nobody has noticed the cold, wind, rain and snow conditions. )Shipments of parts, installation and rebuilding has ground to a halt many times in this new 2014 year. 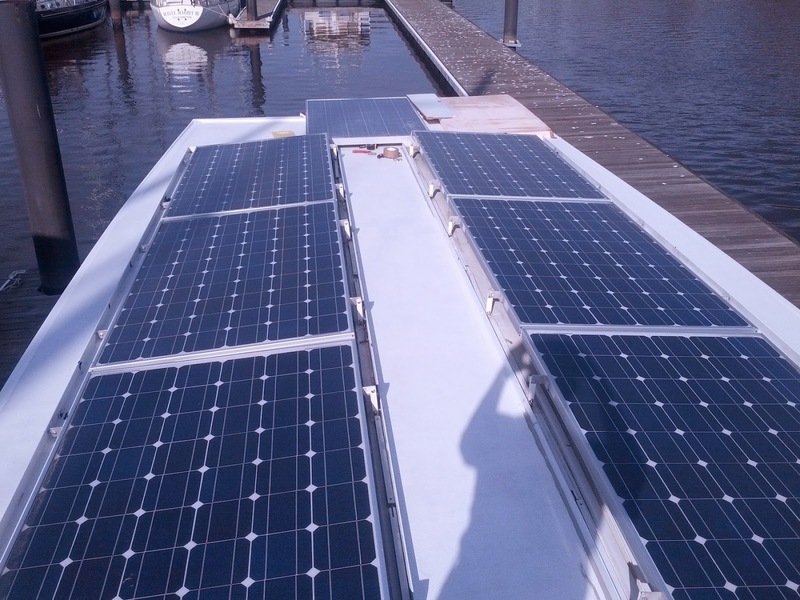 Meanwhile the solar electric yacht will be re-launched to get underway in April. I have had preached to me by a number of folks who have completed the Great Loop, that the most dangerous thing one can do in pursuing the Loop is to keep a tight schedule. Nature has no schedule and is incredibly more powerful. Simply put, yield to nature or die. the stern's roof. Two more will be added to the forward roof. four under the galley sole. under the head sole and another four newest batteries under the galley sole plates. In a recent exchange on AGLCA's forum, George responded to a question that basically asked other members "What is the best method for a ready supply of hot water on a motor yacht? Would a Tankless heater work?" Electric 'flow through or instant' water heating is ok for on land but I would never recommend it for on board a boat. Too much additional testing is needed (in my opinion) to make it safe for on board a boat. Corroding of key parts, water at high temperature, 40 to 80 amps at 240 VAC (wet & killer shock) and potential for grounding problems took it out of my book long ago. Propane is better but still needs great consideration in the user's gas lines, venting, propane sensors, oxygen sensors, care and use. 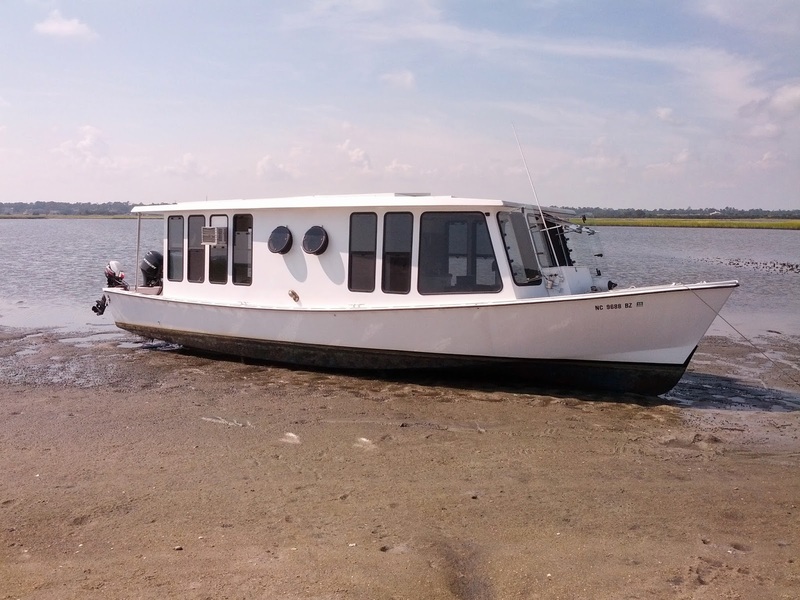 The units such as the Excel by ExcelAmerica http://excelamerica.com/ is what I use on the MOG solar electric yacht. http://www.mogcanalboat.com/ The unit is small and works. If you want a steaming hot robust, soaking, waterfall shower..... nope. There are many other propane units out there in the RV and consumer world. Due diligence and in depth study on your own is key to creating the right system. Even with the current 'marine tank' water heaters there are problems. Tankless (flow through, instant, monotube and such) are compact and require fully reading their install and use manuals, reading customer reviews of Lowes, Home Depot, West Marine and online blogs/reviews.......... before purchase. PS: The MOG NAVY apparel nets enough income to just pay the local USA manufacturer here in Wilmington, NC . Some folks wanted to get items of the sort I wear, so I made it available. MOG's heat source. Note how close unit is to shower.